In very simple terms, it could be said that self-esteem is belief in oneself. When this is securely in place, there is an opportunity to develop confidence. This could be described as not being scared. In a school context this “not being scared” could be putting a hand up to ask a question, volunteering for an assignment or even taking part in physical education activities. Self-esteem and confidence form a key part of the social and emotional needs of all children. In fact, a confident mindset could be the ideal foundation upon which to base the growth mindset and access academic development. If we take this a step further, Sklad et al (2012) and Durlak et al (2011) suggest that there is evidence demonstrating the link between social and emotional education programmes and academic attainment, showing that this type of learning actually improves academic performance. Past emotional and physical experiences (either real or perceived). But as the 21st century unfolds, many believe we are seeing a greater invasion into the lives of young people, where childhoods are being interrupted before family values and positive influences can be fully formed and established. These issues are at the very heart of self-esteem and confidence development in the crucial, formative early years. Ninety per cent fewer qualified teachers of PSHE (PSHE Association, 2015) and less focus on curriculum PSHE. The pressures of exams such as SATs, GCSE and A levels. Social media exposure with peer group expectations and control. The greater accessibility, false familiarity and potential exposure to drugs, including alcohol. The pressures of image and “body perfection” and its association with eating disorders. The increased cases of self-harm and self-destructive behaviours. The “want it now” immediate results syndrome where deferred gratification is not valued. The ever-competitive and comparative nature of society, often fuelled by transient celebrities. The future perception and possible reality of a lack of viable employment. A truly competitive global marketplace. Even the Duchess of Cambridge, speaking earlier this year, has urged schools to provide more emotional support for young children, stating that academic progress is just one measure of success and that emotional stability should be at the centre of a child’s development. So what can be done? Below I describe five steps that I believe will help to develop a more confident mindset in our pupils. Many interventions can be put in place, yet the critical factor to consider is at what time will an intervention give the greatest “return on investment”? I believe the greatest return on investment can be in the transition between primary and secondary education – or around the ages of 11 and 12. This is an age where there is a major change in education and it coincides with the start of true adolescence. The next step to consider is the content. With children seemingly growing up earlier and earlier, their chronological age may not match their emotional age and we may need to create a learning content that has appeal, yet is not too didactic – i.e. teacher preacher – and where feedback is immediate to promote curiosity and engagement. I use the acronym CUPPA, which represents the components or steps for developing self-esteem and confidence. The full acronym stands for: challenge, uniqueness, positivity, perception and action. Two key aspects are challenge and uniqueness. We must try and instil a culture of challenge within young children, rather than bowing down to negative behaviours such as learned helplessness, poor role-modelling and fixed mindsets to certain situations (negative attributions of self). This is where language is key and it is linked to praise. Many researchers such as Professor Carol Dweck – of course known for her work on the growth mindset – but also Hymer & Gershon (2010) and Mary Cay Ricci (2013) say that using words like “smart”, “clever” or “intelligent” can be counter-productive. Rather praise your young people in terms of “effort”, “hard work”, or “never giving up” when trying to beat a challenge. There may be a temptation to use lavish praise and this is understandable. However, praise can be counter-productive if it is person-orientated at final accomplishments, rather than “process or journey-orientated”. By this I mean praise the process of activities not the end result. Also, try to be specific in your praise, but don’t praise easily accomplished tasks such as pushing a chair underneath a table or picking up a pencil from the floor. This process-orientated praise must be reinforced consistently by teachers, parents and even pupils themselves. 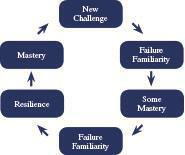 Below is a useful diagram to explain the learning process – it helps build up a feeling of achievement, but it may also lead to failure. Talk about failure as a challenge and how it may even be necessary for success (examples include JK Rowling’s The Benefits of Failure speech, WD40 – named after the 40th attempt to create the product – and the work of Thomas Edison). When Prof Dweck notes children failing she says it is just a snapshot and that they haven’t learned it yet. I take this a step further and call failure “success-not-yet” – so if you don’t give up learning how can you fail? The introduction of the word resilience is also wholly appropriate here. This presents the biggest barrier to the developmental needs of many young children. We must set out right from the start that when we compare to others we are losing some of our self-esteem. Comparison feeds insecurity. To build self-esteem we need to look at a young person’s qualities and achievements, rather than focus on appearance. I “achieve” this by using printed shields and/or walls with spaces on them in which to write individual key qualities and achievements. When a trusted adult or friend also writes something, this is called “confirmation” and this process can be crucial in a young person’s development. When a young person can justify their own qualities and achievements by writing reasons why they have these, this is called “affirmation” and is a key step to understanding their own self-esteem. Any programme must be of sufficient duration to enable small sprouts of growth to happen. It is initially about building up pupil-teacher relationships. It is also about pupils buying into a sustained programme where they are also accountable – they must be involved, demonstrate learning and even take charge of learning! I work with programmes of different lengths but I can recommend programmes that involve pupils once a week (minimum one hour) for at least seven weeks. During this period there should be pre and post measures with regular reviews of progress. Role-models and similar age mentors are very powerful, especially around the age of 11 or 12. This is the age when the influence of parents and teachers starts to take a back seat and peer influence takes over (Emler, 2001). This isn’t all bad news. By using role-models to demonstrate aspects of the learning process, the influence of parents and teachers can still be effective. Ideally, when role-models are around two years older and of similar academic and emotional backgrounds, the potential for progress is massive. Role-models demonstrate that progress is possible in much the same way as discrete measurements. We all know that education is about testing, right? So measurement of self-esteem and confidence is equally crucial. It gives the opportunity for all involved to see progress or barriers to progress. Care must be taken not to compare pupils with other individual scores or even compare them to a set or category of tables or graphs of expected performance. What this means is that the best forms of testing compare only where individual A started and where individual A finishes. With this in mind, I use an adapted version of the Rosenberg Self-Esteem Questionnaire (1965) which is aimed at measuring the self-esteem of adolescents. I adapt some questions and I omit categorisation. Simply compare where you start and where you end. Similarly I have created a CUPPA Challenge (email me for more details), which uses 10 simple questions to assess self-esteem and confidence. I have provided a categorisation table which is positively stated if you wish to categorise scores – but be careful! The Confidence Gap, Dr Russ Harris, 2011, Robinson Publishers. A Curriculum for Life: The case for statutory PSHE, PSHE Association, 2015. Mindset, Professor Carol Dweck, 2006, Robinson Publishers. Growth Mindset Pocketbook, Hymer & Gershon, 2012, Teachers’ Pocketbooks. Mindsets in the Classroom, Mary Cay Ricci, 2013, Prufrock Press. The Self-Esteem Scale, Morris Rosenberg, Princeton University Press (1965) – can be found by searching online.